I was at first hesitant about purchasing a combination washer and dryer but with the space limitations it was essentially the only option. The whirlpool WGT3300SQ gas washer and dryer unit changed my opinion of these combination units in heartbeat. The unit is straight-forward and simple in operation. A relatively standard four rinse/wash temperatures, three spin/wash speeds and four water level options are included. Where I was impressed was with the tumble press option included in the unit. This feature "helps freshen clothes and lessen wrinkles when you're in a hurry and don't have time to iron," according to whirlpool and does exactly that. Rather than being forced to iron dress clothes after having been through a drying cycle, this whirlpool feature eliminates the need and saves time. Noise is another one of the primary issues at the forefront when making a washer and dryer purchase. 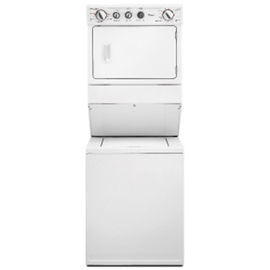 The Whirlpool WGT3300SQ operates at a reasonable noise level, no complaints on this front. Another feature that is quite innovative and helpful is the self-cleaning lint filter. This was always a worry of mine as I had heard horror stories of houses being burned down due to uncleaned lint traps. The self-cleaning unit on the Whirlpool WGT3300SQ eliminates this concern and removes teh need to clean those unsightly lint traps. At an MSRP of $1,159.00 this unit fits well within the budget of most middle-income consumers. The unit, available only in white, does appear rather standard and leave little to the imagination. This unit does what it claims and it does it well. It would be nice if whirlpool offered this unit in other color combinations to allow for better blending in households with less than traditional white walls. This would be my only major complaint about this unit. I would recommend this combination washer and dryer to anyone looking to upgrade but with space constraints. Whirlpool is a well trusted brand with a hassle-free product offering excellent value. Having whirlpool in the house is like having one stop solution for all kitchen needs. The model wgt3300x is now an outdated version, and I find in essay writing help about various upgrades which perform better than this one. However, whirlpool is a good company and anyone considering to buy this model should not hesitate to do so because it is excellent one. Join in and write your own page! It's easy to do. How? Simply click here to return to move all reviews from mechanical turk Washer / Dryer COMBO to washer / dryer combo page .